The region is demarcated since 1908 and is located in the extreme North of Portugal, bounded north by the Minho river, spreading along the Atlantic coast to the city of Porto, and south up to the shores of Vouga river. The wine region of the "Vinho Verde" (Green Wines) is the largest in Portugal, with its 34000 hectares spread along a coast area geographically well situated, rich in water resources, with mild temperatures and abundant rains, which created homogeneous and mainly granitic soils, fertile and with high acidity, excellent for the production of white wines. 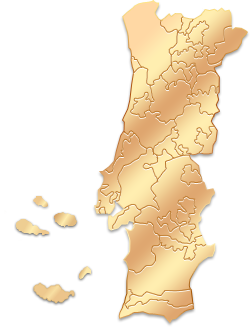 The brand image of this region is the variety Alvarinho. The flagrant typicality and originality result essentially of the peculiarities of the autochthonous varieties of the region and the way they are cultivated. From all these factors results a naturally light, clean, refreshing and aromatic wine, different from any other in the world. Natural issues, microclimates, wine types, vine varieties and ways to cultivate them, led to the division of the Demarcated Region of the Green Wine in nine sub-regions: Amarante, Ave, Baião, Basto, Cávado, Lima, Monção e Melgaço, Paiva and Sousa. The dominant white varieties are Alvarinho, Arinto (Pedernã), Azal, Loureiro, Avesso and Trajadura, while in the red varieties the dominant are Borraçal, Espadeiro, Brancelho e Vinhão. Since 1999 the region produces sparkling wines of great quality and shows itself as one the most promising places for the production of top sparkling wines. The green coast presents its savage landscapes, fustigated by the wet winds, which make it a unique region in Portugal. On the way, each city preserves a strong identity. The National Park Peneda-Gerês was founded in 1971 and is one of the biggest and most important natural parks of Portugal, being the only one that has the status of National Park. We recommend you to visit the villages of Soajo, Ermelo, Lindoso and to the old Roman Road of Via Geira. Ponte de Lima owes its name and its notoriety to the roman bridge that crosses the Lima river. It’s very charming, with its old manors surrounded by hectares of vineyards, in the centre of an important producing region of green wine (vinho verde). It is recommended a visit to the Medieval Bridge, the Terceiros Museum and to the Rural Museum. One of the wonders of Minho, relatively well hidden, Viana do Castelo, is an attractive city built in the right bank of the river Lima. It is also recommended a visit to República Square, to the Mother Church, to the Municipal Museum and to the Ship Gil Eanes. Braga, the capital of Minho, is known for its churches, monasteries and sanctuaries. We recommend you to visit the Sanctuary of Bom Jesus, Sameiro and the Cathedral. Viana do Castelo station, Avenida of Combatentes da Grande Guerra, +351 258 882296 / Largo da Estação, Braga, +351 253 278252 / Amarante Station, +351 808 208208. More info: www.cp.pt. Autoviação Minho, + 351 652917/251 / AV. Capitão Gaspar de Castro, Viana do Castelo, +351 258 809352/ Praça da Estação Rodoviária, Braga, +351 253 209400. Monção: From the city of Porto, follow the A3/Braga / Valença, then follow the EN 101 to Monção. From Lisbon, take the A1/Porto and in the city of Porto, by the VCI take the A3/Braga / Valença, then follow the EN 101 to Monção. Ponte de Lima: From the city of Porto, follow the A41 / IC24, take exit 3 by Maia, then take the A3 / Braga / Valença and take exit 11 towards Ponte de Lima. From the city of Lisbon, follow the A1/Porto and in the city of Porto take the connection A3 / Braga / Valença and take exit 11 towards Ponte de Lima. Amarante: From Porto, follow A3 / Braga/Vila Real, connect with A4 Vila Real / Valongo to exit in Amarante. From Lisbon, take the A1 to Porto, in the city of Porto take the VCI and then take the connection Braga A3 / Vila Real and then make the connection with the A4 Vila Real / Valongo to exit in Amarante. Tourism Region of Alto Minho, Praça Deu-la-deu, +351 251 652757 / Tourism Region of Alto Minho, Praça da República, Ponte de Lima, +351 258 942308/ Tourism Region of Alto Minho, Praça da Erva, Viana do Castelo, +351 258 822620/ Tourism Region of Verde Minho, Avenida da Liberdade, 1, Braga, 253 +351 262550.